The Hills Resort located on one of the most stunning lakes in America, Priest Lake. This photo of Jon and Sarah was actually the following morning after the wedding. One of the great reasons its so much fun to be a part of a destination wedding, is to have more opportunities such as this. Sarah mentioned to me the night of the wedding that they wanted to jump in the lake for a photo. Early June in North Idaho is not the warmest weather by the way. The water was cold. Not only that she was pregnant during the making of this image. My clients tend to be so carefree and fun. 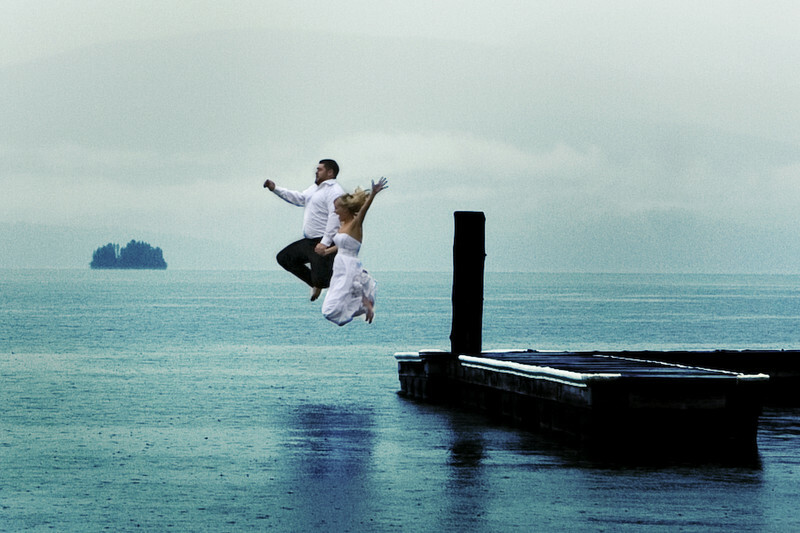 I have seen many Jump photos created over the years and most of the photographs I encountered were taken in front of the couple jumping. As an artist, my vision for this image was not only to show that they were having fun, but I also wanted the weather to be seen for what it was. It is not a happy day per se, however this couple just got married and this was the happiest day of their lives. Taking the plunge as many naysayers suggest. It seemed appropriate. We woke up early and they put their wedding clothes back on and off we went. As a photographer I knew I only got one chance to make this pic awesome. What would have happened had I not hit the shutter at the right time? Or the fact that they would have to re-take the shot looking all wet. So glad I nailed it. I hope you enjoy this picture as much as I do. I know its enjoyed by many because it is my stolen image over the years. Yes many businesses, schools, and even hunting websites have used this image for one reason or another. How they had access to it, I am not sure. But, flattering to say the least. Location: Hills Resort, Priest Lake, Idaho. Keywords: Wedding Pictures at Hills Resort (3).